View More In Sound Measurement. 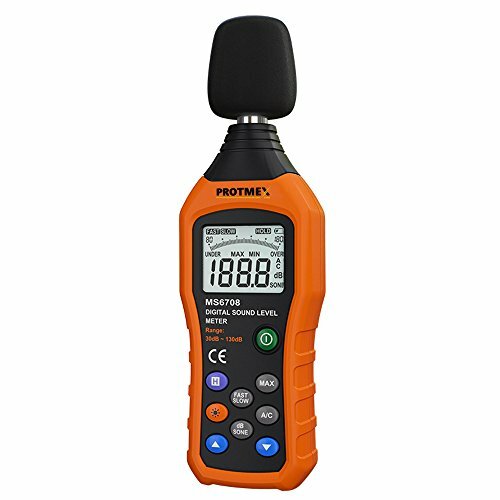 Whether you're monitoring workplace machinery, installing audio or alarm systems, or handling product noise certification and reduction, the Protmex Digital Sound Level Meter gets the job done. The lightweight meter easily fits in your hand and can be used wherever you need it. The sound level meter shows the sound level readings using a fast-responding analog bar graph with a 50-decibel range that updates every 125 milliseconds for viewing varying trends. Sound pressure frequency response: 30Hz - 8KHz. Dynamic range of sound pressure: 50 dB (for each measurement gear level). Sound pressure measurement scope: 30-130 dB A, 35-130 dB C.
Sound pressure frequency weighting characteristics: A and C characteristics. Digital display: 4-digit, resolution: 0.1 dB, sampling rate: 2 times/sec. Analog bar display: Each analog bar represents 1 dB, sampling rate is 20 times/sec. Measurement gear level: 30-80 dB, 40-90 dB, 50-100 dB, 60-110 dB, 70-120 dB, 80-130 dB, 6 gear levels in total. Automatic shifting gear level: microcomputer will automatically select the best gear level in the range from 30 to 130 dB. Below or above limit prompt: indicated with "UNDER" or "OVER" display. As "Peakmeter" is our old logo, and "Protmex" is our new Logo, thus the items we sent you may include the two logo, but please do not worry, they are the same item with the same quality. This sound level meter is used to measure the sound level of sound equipment in Work and Life: such as factories, workshops, schools, residential, office areas, traffic roads, audio and other occasions. Also applies to noise engineering, product quality control, health control and so on. With the backlight feature, it is appropriate for gathering the sound data at night. To save power, backlight auto power off function is provided. The Decibel meter utilizes a electric condenser microphone to monitor sound levels from 30 to 130 decibels at an accuracy of +/-1.5 dB with a 0.1 dB resolution. A and C weighting network selection. The Protmex sound meter weighs less than 7 ounces, and is designed to fit comfortably in the palm of your hand.